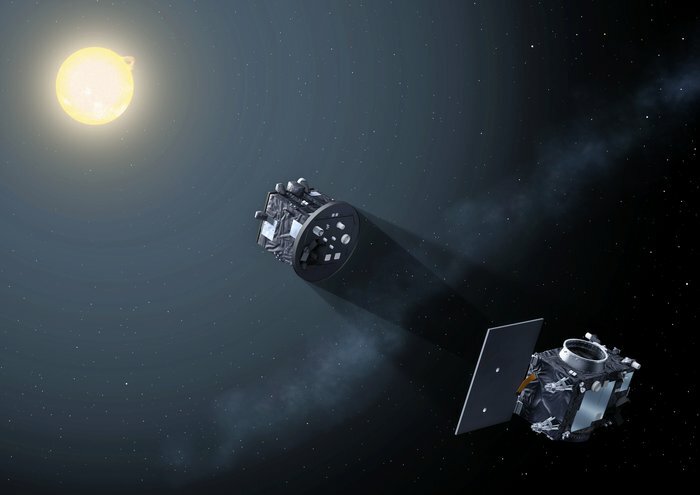 ESA’s Science Programme has agreed to support the technology-demonstrating Proba-3, a double-satellite formation-flying mission tasked with observing a region of the Sun normally hidden from view. Set for launch in late 2020, the two satellites making up Proba-3 will fly at a precise separation to cast a shadow across space, blocking out the disc of the Sun to reveal details of its ghostly surrounding ‘corona’ – usually masked by dazzling sunlight. Proba-3, like all the missions in the Proba series, is first and foremost a technology demonstrator, exploring precision formation-flying techniques so that future multiple satellites flying together could perform equivalent tasks to a single giant spacecraft. But, following a longstanding Proba tradition, the mission has also been given an ambitious scientific goal: returning scientifically useful data is a good way of proving the technology works as planned. Proba-3 will offer solar scientists a window on the inner segment of the solar corona – a mysterious region because it is more than a million degrees hotter than the surface of the Sun it surrounds. Up until now, the best way to observe the corona has been during a solar eclipse, although stray light through Earth’s atmosphere is a limiting factor. As an alternative, space-flown ‘coronagraphs’ create artificial eclipses inside Sun-watching satellites such as SOHO and Stereo, but stray light still bends around their blocking discs, limiting access to the all-important inner corona. Proba-3 will get around this by flying the disc of its coronagraph on a separate satellite, exactly 150 m apart, lined up with the Sun. This should open up a new view of dynamic regions extremely close to the solar surface, where the solar wind and the eruptions called ‘coronal mass ejections’ are born. Coronal mass ejections are primary sources of disturbed space weather at the Earth. Solar eclipses. Released 12/06/2008. Copyright Wendy Carlos & Fred Espenak. Proba-3 is funded through ESA’s Directorate of Technology, Engineering and Quality, but in June the Agency’s Science Programme Committee endorsed the mission for additional backing through the Directorate of Science. “It was clear that it would be very beneficial to have this mission supported in the Science programme,” explains Andrei Zhukov of the Royal Observatory of Belgium, serving as Principal Investigator for Proba’s coronagraph. “There was widespread enthusiasm in the solar physics community. The Science Programme Committee is advised in turn by its advisory committees composed of scientists from all around Europe, giving independent endorsements, and they recommended Proba-3 be supported as a ‘mission of opportunity’. “In plain terms, the running of Proba-3’s Science Operations Centre, which will process and distribute scientific data to scientists across Europe will be funded by the Science programme. This centre will be hosted here in Belgium, with contributions to the data processing pipeline made by Germany, Poland and Romania. A fiery solar explosion. Released 16/09/2013. Copyright SOHO (ESA/NASA)/S. Hill. 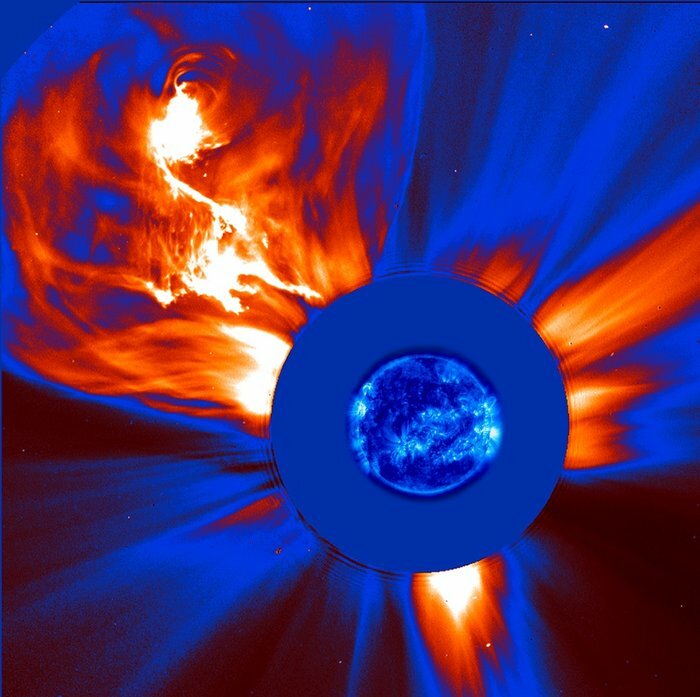 A coronal mass ejection observed by the ESA/NASA SOHO space mission on 4 January 2002 has been coloured to indicate the intensity of the matter being ejected by the Sun. White represents the greatest intensity, red/orange somewhat less, and blue the least. An extreme-ultraviolet image of the Sun captured by SOHO’s EIT (Extreme ultraviolet Imaging Telescope) instrument is superimposed on the image. The shaded blue disc surrounding the Sun at the centre is a mask in SOHO’s LASCO instrument that blots out direct sunlight to allow study of the details in the Sun’s corona. “During each highly elliptical 19.6 hour orbit, Proba-3 will be imaging the corona for about six hours at a time, at a typical rate of one image per minute, although we have the ability to increase this rate to once every two seconds for phenomena of special interest. Proba-3 project development continues to progress well, with a structural and thermal model version of the coronagraph built, ahead of its critical design review due to take place this autumn, followed by that of the entire mission. The challenge is in keeping the satellites safely controlled and correctly positioned relative to each other. This will be accomplished using various new technologies, including bespoke formation-flying software, GPS information, intersatellite links, startrackers, optical visual sensors and optical metrologies for close-up manoeuvring. Dancing is probably the oldest human artform – and now ESA’s Proba-3 precision formation-flying mission intends to extend the art of dance to space. Like dancers, a pair of minisatellites will move around each other, their relative positions maintained to millimetre-scale precision, as if they were both parts of one giant spacecraft. Their mission is to cast a shadow from one minisatellite onto another, in order to form an artificial total solar eclipse in space – then study the fine details of the Sun’s wispy atmosphere, the solar corona. Franco Ongaro, ESA Director of Technical and Quality Management; Frederic Teston, Head of System and Cost Engineering; Andrea Santovincenzo, ESA engineer and the project’s manager Agnes Mestreau-Garreau, explain how to go about teaching a space mission to dance. Credit: European Space Agency, ESA.